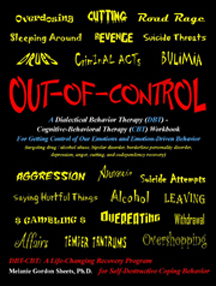 Here’s an “adapted” excerpt from the DBT-CBT “Out-of-Control” therapy workbook. It’s from Chapter 7, the Rational Mind chapter. This chapter discusses Rational Mind in detail and offers many Rational Mind challenges for the Emotional Driven Lies we tell ourselves AND WE BELIEVE…ones that often sabotage our self-esteem and our recovery. The truth…we MAY HAVE failed at MANY tasks. If so, we need to rationally understand why. Quite often, we fail because we DON’T TRY to succeed. We “KNOW” we can’t do it…so we DON’T TRY, or we DON’T TRY VERY HARD. Despite USUALLY giving things ONLY A HALF-HEARTED EFFORT, we may recall some times WHEN WE REALLY TRIED, but failed anyway. BUT, DON’T THINK we’re off the hook because of some FULL EFFORT failures. WE DON’T GET TO STOP TRYING just because when we’ve REALLY TRIED, we’ve still failed! Rational Mind would inform us that MOST PEOPLE WHO SUCCEED HAVE FAILED MANY TIMES. There are many TRUE stories to support this TRUTH. Abraham Lincoln ran for MANY political positions and lost MANY TIMES before he ever WON an election. The ONE he won was THE BIG ONE…the PRESIDENTIAL election! There are MANY stories about business leaders who had MANY failed businesses before they hit it big! Henry Ford went bankrupt 5-6 times because of failed businesses before he gained success in the automotive industry. The Heinz company had the same kind of start. Have you read that Oprah was fired from a reporter’s job because she wasn’t right for TV? Somebody certainly misjudged her! before they achieved great success. When we fail, we need to SEEK AN UNDERSTANDING of WHY we failed. We need to LEARN FROM IT and CORRECT WHAT WE’RE DOING. We need to change or adjust our plan to deal with what went wrong. Successful “failures” start with PLAN A and go to PLAN B, C, D, E…and so on until things work out! Despite their failures, THEY KEEP ON KEEPING ON! It’s also important to be Mindful of our successes and accomplishments and to note WE’VE ALL HAD SOME! We also need to realize that WHEN WE’VE TRIED…when we’ve REALLY STUCK WITH IT, we’ve overcome challenges…and WE HAVE BEEN SUCCESSFUL. Consider the 8-18 attempts at recovery that it takes people ON AVERAGE to become clean n’ sober. Through our recovery attempts, we learn about our triggers and relapse patterns. We learn we REALLY HAVE TO change the things in our life that we DON’T WANT TO CHANGE…things that we’ve refused to change, like friendships, activities, and abusive or conflict-filled relationships. Because of our repeated failures at recovery, we FINALLY SUCCEED! That’s because we’ve revised our Recovery Plan SO MANY TIMES that we FINALLY GET ENOUGH OF THE NECESSARY CHANGES made! We’re hard-headed and we’ve got to learn from OUR experiences…and in the world of recovery…these experiences ARE OFTEN RELAPSES. Changing our LIFESTYLE and our LIFE IS VERY DIFFICULT. IF we learn from them. The truth is, WHEN WE KEEP TRYING, things FINALLY work out. Sometimes, we don’t succeed because we aren’t going about it the right way. Therefore, we need to get a NEW PLAN. Sometimes, we try to do more than is do-able at one time. We plunge head first when we’d be better off wading in and taking smaller steps! There are many reasons why we haven’t reached our goals. Fortunately, most of these problems can be overcome with PERSISTENCE and a REVISED GAME PLAN! Footnote: This footnote is “margin text” from the workbook alike the dark red inserts in the text above…however, these weren’t so easily woven in! This first one relates to the 8-18 tries at recovery it takes on average to recover from substance abuse. “We never fail until we quit trying. then we can constructively accept our failures and learn from them. we won’t take someone’s advice or learn from THEIR experiences. which is often OUR failures! if we fail to learn from it! our failures become a stepping stone toward success! and to Turn On Wise Mind to make some adjustments to our Game Plan! That’s because WE haven’t failed, our plan has! Hope you enjoyed this blog entry and that it helps to challenge destructive “failure” thoughts. It took half of forever to format this…the format of the workbook doesn’t cut n’ paste very well…or at least I haven’t learned yet how to do it more efficiently! Life is one big learning curve and I guess sometimes we’ve just got to hold on…persevere…and enjoy the ride!